I’ve always looked at foaming hand soaps in the store aisles while shopping and walked right on by. After all, why would I want to pay so much money for a fancy foaming hand soap when I could use a liquid hand soap instead? 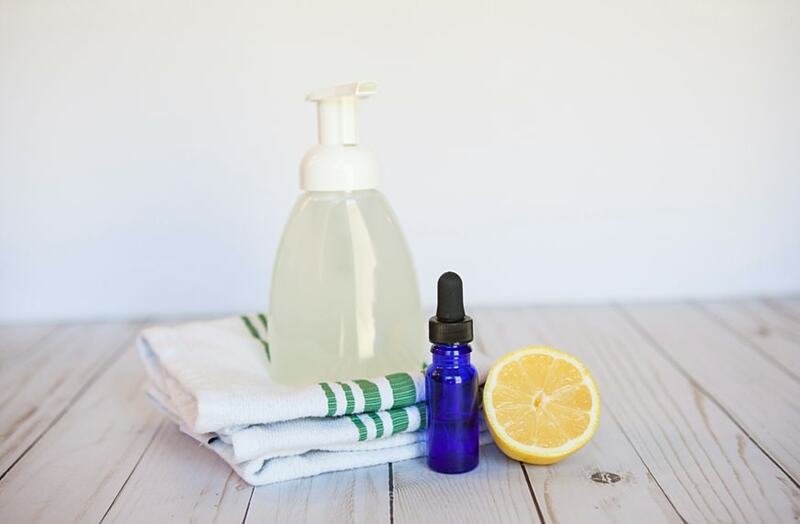 But then I found this foaming hand soap recipe using essential oils. And I realized that my excuses might have run out for not adding fancy foaming hand soaps to my healthy home. Because this foaming hand soap recipe is so simple! And SAVES MONEY! I’m spoiled. I generally only use products that I’ve hand picked for my home. And I put a lot of thought into every single product that I bring into my home (and then I share them with you!). I research for chemical exposures, organic and natural ingredients, and whether or not the product will be beneficial to us or hurt our health. But when I’m outside of my home, I can’t control the environment. One of the biggest examples is using hand soaps. Seriously. When I use a hand soap in a bathroom at a store, they are usually so harsh that my hands are instantly dry and cracked. And when I’m flying. Oh, WOW! Using hand soaps in airport bathrooms and on the plane instantly makes my hands dry, rough, cracked and almost white because my skin is so dry. That’s the problem with most other hand soaps. They’re drying, full of chemicals, and harsh to your skin. Natural ingredients will clean your hands and kill germs just as well. With the FDA stating that harsh antibacterials (such as triclosan) aren’t even necessary or useful in hand soaps, there is no need to continue to lather up with hand soaps containing lots of chemicals. 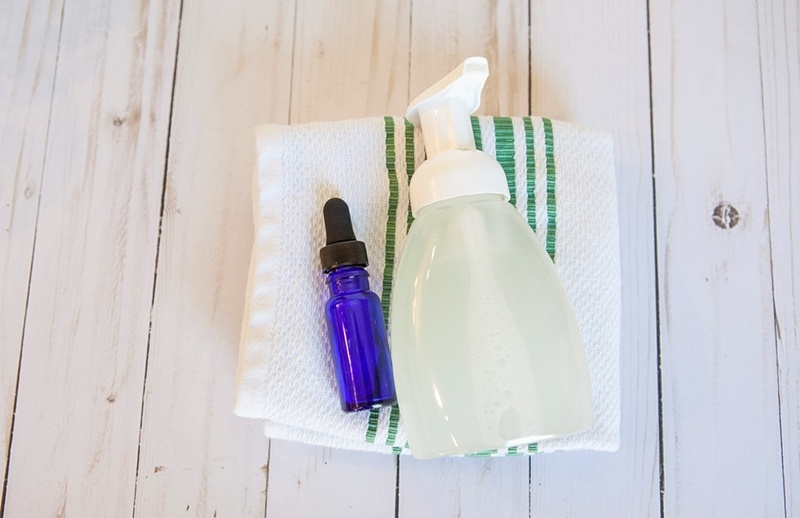 So why not make your own foaming hand soap with natural and nontoxic ingredients? 1. Add the water to the foaming hand soap dispenser. You don’t want to fill it all the way to the top. And you might need more or less than a cup depending on your dispenser. Be sure to leave about an inch of room on top. 3. Use in bathrooms, your kitchen sink, laundry room sink and wherever you frequently wash your hands. Consider making a bottle to use at work, too! Your co-workers might be thankful! Which Essential Oils Should I Use in Hand Soap? 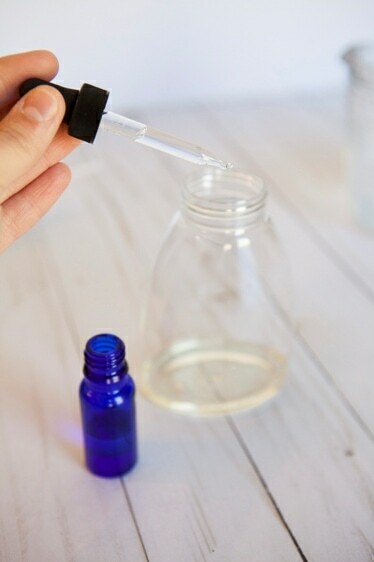 The best idea is to buy a multi-pack of organic essential oils to have many different scents that can be used for all kinds of DIY recipes (such as no streak homemade glass cleaner spray and all natural kitchen cleaner). Do not add soap first, then water. This will cause the soap to foam up inside the bottle, which makes it hard to add the proper amount of ingredients. Be sure to use unscented castile soap! If you want to customize your foaming hand soap with an aromatherapy blend that makes you happy, you only want the scent that you choose. However, if you want to skip the essential oils, you can buy scented Dr. Bronner’s castile soap. I like Dr. Bronner’s castile soaps because they have been around for so long and are well respected and are among the best! 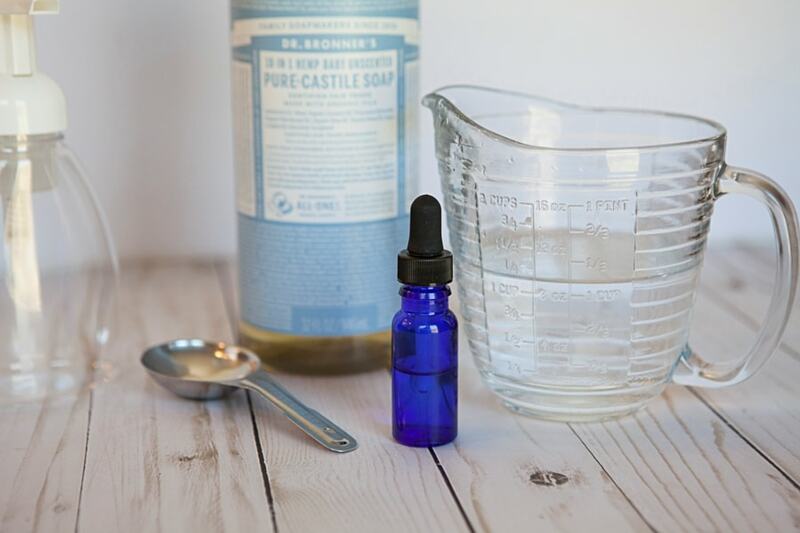 Consider Dr. Bronner’s castile soaps in scents such as Peppermint, Rose, Tea Tree Oil, and Citrus Orange. Dr. Bronner’s Unscented Baby Castile Soap uses double the olive oil so that your hands will be extra moisturized using the foaming hand soap. Not using the unscented version? Feel free to add 1/2 teaspoon of olive oil, almond oil, jojoba oil or another natural oil for extra moisturizing.